Note from your editor-in-chief: Roshawn has finished two of the latest Marvel Comics. He really likes Magneto, but is very “meh” about Nightcrawler. Read on to discover his full thoughts. Magneto, savior of Tuesdays! Someone needs to tell Cullen Bunn and Gabriel Hernandez Walta that revenge is a dish best served cold because this book is HOT!!! I have really loved the whole Magneto series! 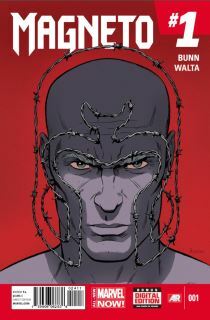 Cullen Bunn has been given the chance to finally give Magneto the on-going series he so richly deserves and he has more than produced the goods!! With such a rich history and characteristics like that of an old school Parker novel (Richard Stark’s), Magneto is giving the fans what they have longed for…some good old fashioned Marvel revenge. With art coming from Gabriel Hernandez Walta, you get to see all the gruesome details. If you’ve been part of the Anti-Mutant agenda, you might want to stock up on Depends because Magneto is hell-bent on ridding the world of those that have killed his mutant brethren and, so far, he hasn’t shown an inkling of mercy. Pulling out all the stop signs and bashing you across the face with them, Magneto is a book to get that will keep you entertained through every page. Nightcrawler… meh. The team of Chris Claremont and Todd Nauck got me so excited! I have loved everything I’ve read from Chris Claremont! From his X-Men to his Star-Lord. I just can’t get enough of his stuff. And Todd Nauck, wow! I mean, I collected all of Young Justice, Wildguard and a lot of Todd Naucks’ Friendly Neighborhood Spider-Man, but I can’t get behind this one. I am really disappointed with this book so far and, after talking to a buddy of mine, I now know why. This version of Nightcrawler is pretty much where the character left off in the 80’s. It goes back to a funnier Kurt Wagner, less hardened by the events of Manifest Destiny and X-Infernus, and brings people up to speed with his circus roots. 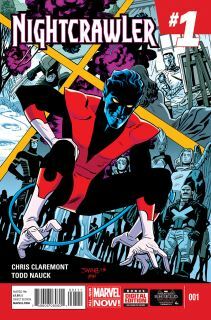 I’m not saying Nightcrawler was always a favorite of mine but I’ve seen his roots already. I don’t think a successful Nightcralwer book should have to lean on that. I want swash-buckling Kurt to make an appearance. I know it’s been a minute with the swords but, and any Nightcrawler fan can admit it, he was a lot cooler with the swords. His fight panels were cooler and the way he employed his power with the swords was fascinating. I guess what I really am trying to say is I love the art and the writing….but I can’t get interested in the story I’ll give it one more shot though. I really love that one of the circus folk brought up how Kurt must be having a hard time with his rebirth as he is a devout Catholic. I am very interested to see where Mr. Claremont takes him in terms of dealing with his faith. For how can a man not tested, truly be deemed faithful? These guys have never made me question where they are going to end up, so I have to assume that I am going to love the story…eventually. For now, I will just continue drooling over the fact that I see their names on the covers.